This was really quick and easy to through together. I behaved this time and actually measured out what I was using so it was easier to share with you guys. Mix together the flour, garlic salt, paprika, pepper, and Italian Seasoning in one bowl. Beat the eggs in another bowl. Dip the chicken in the egg, then in the flour mix making sure both sides are coated well. Place in the pan. While that is baking cook your noodles and if the sauce is not premade heat it up (if you are making a fresh batch you will want to do the sauce a little before starting the chicken). When chicken is done, place a spoonful of sauce on top and then put some mozzarella cheese on it. Bake for about 5 more minutes (until cheese is melted). Note: halfway through baking to get that golden look you can pour some melted butter over the top of the chicken. 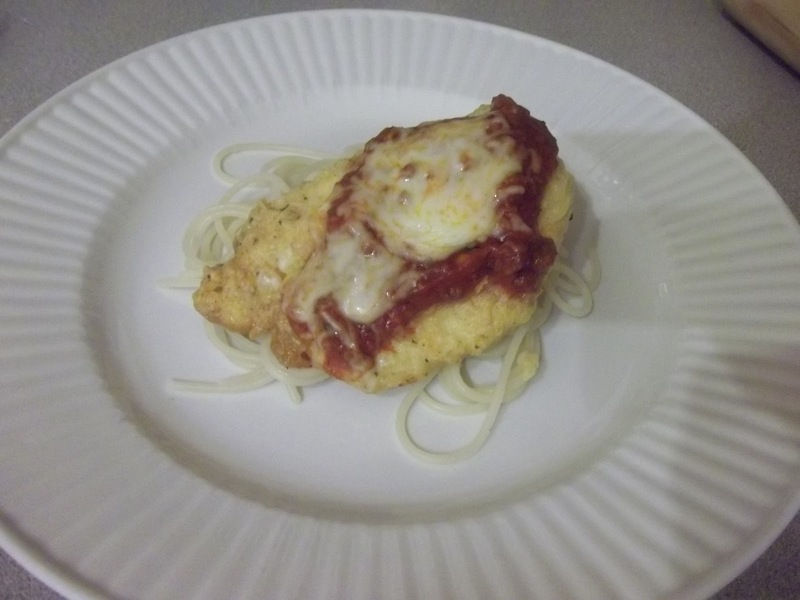 This entry was posted in Chicken, Recipes on January 23, 2012 by Kandi. I hope you enjoy it! My kids are already asking to have it again.